At 222 feet across, almost 300 feet in length, and 65 feet above the ground, Lockheed Martin's C-5 Galaxy is the largest transport aircraft in the US Air Force. With a cargo hull 121 feet long and 19 feet across, the C-5 is a flying warehouse that can carry a combat-ready military unit or deliver necessary supplies anywhere in the world. The C-5 has a cargo capacity of 142 tons, the equivalent of carrying two M1A1 Abrams tanks, 6 greyhound buses, or 25,844,746 ping pong balls. In the slides below, see just how awesome the C-5's carrying capacity is. Staff Sgt. Randall Ard, 730th Air Mobility Squadron crew chief, clears the runway for a C-5 Galaxy at Yokota Air Base, Japan, Aug. 31, 2015. US Marine Corps Bell AH-1 Sea Cobra helicopters and a Bell UH-1N Twin Huey helicopter are parked on the flight line as a US Air Force C-5A Galaxy aircraft stands by after unloading supplies during Operation Desert Shield on 23 January 1991. To ease on and off loading, the C-5 opens from the nose and the tail end. Members of the 451st Expeditionary Logistics Readiness Squadron aerial port flight and 22nd Airlift Squadron prepare to load a U.S. Navy F/A-18 Super Hornet fighter aircraft onto a U.S. Air Force C-5 Galaxy cargo aircraft on Kandahar Airfield, Afghanistan, Aug. 18, 2011. More than 266,000 pounds of cargo and armored vehicles are seen loaded into the C-5 in Afghanistan. Airmen from the 9th Airlift Squadron and 455th Expeditionary Aerial Port Squadron work with Marines from the Marine Expeditionary Brigade to load vehicles into a C-5 Super Galaxy Oct. 6, 2014, at Camp Bastion, Afghanistan. Here the C-5 unloads an 81 foot boat for the Navy. A C-5 Galaxy offloads an 81-foot boat for the US Navy at Coronado Naval Base, California. A C-130 Hercules training fuselage is loaded into a C-5 Galaxy for transport to Stratton Air National Guard Base, N.Y. This was the first time a C-5 transported a C-130 fuselage. 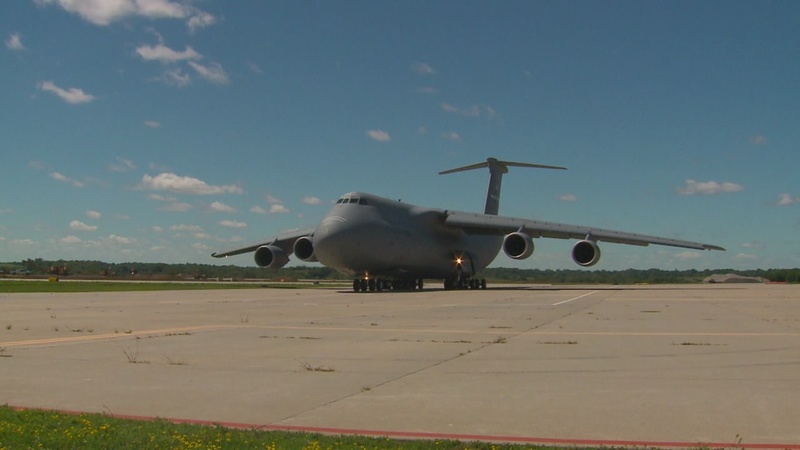 In times of trouble, when aide is needed on a huge scale, the C-5 is a welcome sight. A C-5 Galaxy from the Air Force Reserve Command's 433rd Airlift Wing is ready to depart a deployed location on another mission supporting Operation Iraqi Freedom.